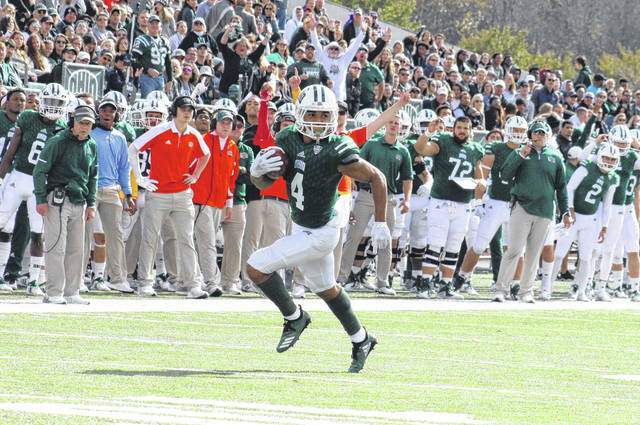 Ohio senior Papi White (4) breaks a touchdown run, during the Bobcats’ victory over Bowling Green on Oct. 20 in Athens, Ohio. Ohio senior A.J. 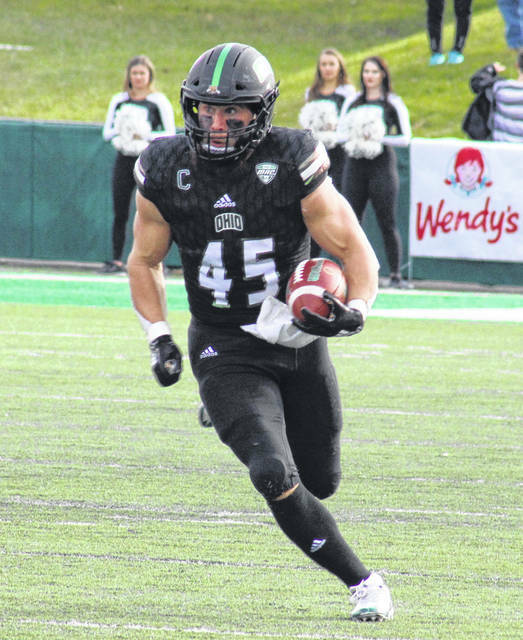 Ouellette (45) carries the ball, during the Bobcats’ victory over Akron on Nov. 23 in Athens, Ohio. CLEVELAND, Ohio — A fine nine. The Ohio football team landed nine players — six from the offensive side of the ball — on the 2018-All-Mid-American Conference football teams, released on Wednesday. The Bobcats earned six first team selections — the program’s most since picking up seven in 1968 — after having just one first teamer a year ago. Ohio’s other three selections on this year’s squad came on the second team. On the all-conference team for a third time in his career is OU redshirt-junior defensive back Javon Hagan, who was a second team selection twice before moving up to first team this fall. In 11 games this season, Hagan finished with 72 tackles, half of which were solo, while intercepting two passes and recovering a fumble. Joining Hagan on the first team defense is Bobcats redshirt-junior punter Michael Farkas, who was a third team selection in 2016. Farkas — a two-time MAC East Special Teams Player of the Week — earned 43.6 yards per punt this season, hitting his season-high of 59 on three occasions. A quartet of seniors represented Ohio on the first team offense, running back A.J. Ouellette, wide receiver Papi White, left tackle Joe Lowery and left guard Joe Anderson, each moving up from second team last season. Lowery and Anderson anchored the Bobcat line, which led the way to 470.6 yards per game, including 261.9 yards per game on the ground. Ouellette carried the ball for 1,142 yards and 12 touchdowns this fall, while also catching a pair of touchdown passes. Ouellette is the fourth Bobcat running back in program history to hit the 1,000-yard milestone in multiple seasons. He’s third on Ohio’s all-time rushing yardage list, and fourth in all-time rushing touchdowns. White — who appeared on the 2017 team as both a second team wide receiver and a third team punt returner — is the first Bobcat wide receiver to land on first team since 1983. The program’s all-time leader in receiving yards, White caught 58 passes for 897 yards and nine touchdowns this fall, while adding another touchdown on the ground. On the all-conference second team for a second straight season is Ohio redshirt-junior quarterback Nathan Rourke, who finished the year completing 154-of-252 passes for 2,228 yards and 22 touchdowns. Rourke — responsible for 74 touchdowns in his career, second-most in program history — also carried the ball for 816 yards and 13 touchdowns this season. Earning their first-ever all-conference honors are right guard Durrell Wood and outside linebacker Evan Croutch. While Wood was helping Lowery and Anderson up front on offense, Croutch led the team with 79 tackles, including 54 solo. Croutch picked off two passes and came up for a quartet of sacks for the Bobcat defense, which was the second-best team in the conference against the ground attack. RB – Jamauri Bogan, Western Michigan !